IN NOT one, but two glamorous gowns, Meghan Markle stunned the world. As the new Duke and Duchess of Sussex stepped out of Windsor Castle off to their evening wedding reception, they looked the epitome of class with Prince Harry in a Bond-worthy tux and Meghan wearing a bespoke lily white dress with a high neckline designed by Stella McCartney. But it was their awaiting carriage (or should I say, a stunning silver blue Jaguar E-Type Concept Zero) that had a hidden detail you might have missed.The hidden details you might’ve missed form the royal wedding. 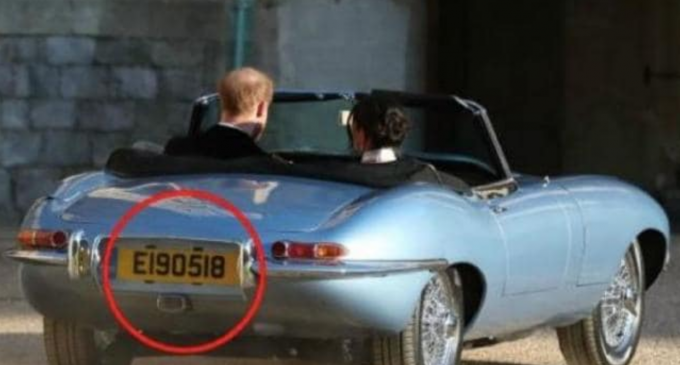 The hidden details you might’ve missed form the royal wedding.Catching a glimpse of the numberplate as the newlyweds departed Windsor Castle for Frogmore House, the string of numbers had a very sentimental meaning. The plates on the car — which was originally manufactured in 1968 and converted to electric power — read E190518, their wedding date. Keeping with the blue theme, another subtle nod that perhaps wasn’t as easily overlooked was the aquamarine ring that sat perfectly on Meghan’s right hand. The stunning emerald cut piece of jewellery — which once belonged to Prince Harry’s late mother, Princess Diana — was reportedly given from her new husband after the wedding ceremony.The stunning aquamarine ring Meghan Markle wore to their second wedding reception. The stunning aquamarine ring Meghan Markle wore to their second wedding reception. The ring — which Diana first wore to an auction of her own wardrobe at Christies in 1997 — is the second accessory that Meghan wore on her wedding day as her “something blue”. She also wore Aquazzura shoes with baby blue painted soles to the wedding reception at Frogmore House.And while jaws dropped as the Duchess of Sussex stepped out in her reception gown, the silk-crepe dress had far more meaning than simply being created by a British designer. Stella McCartney, 46, is the daughter of rock ‘n’ roll legend Sir Paul McCartney, the former Beatles member who was knighted by Queen Elizabeth II just over 20 years ago. And in 2013, the designer herself was awarded an OBE (Order of the British Empire) in the Queen’s New Year’s Honours. The Duchess of Sussex, Meghan Markle, leaving Windsor Castle to attend an evening reception at Frogmore House. Picture: AFPThe Duchess of Sussex, Meghan Markle, leaving Windsor Castle to attend an evening reception at Frogmore House. Picture: AFPSource:AFPAds by KioskedSir Paul McCartney took to Instagram to share a photo of the dress, saying how “proud” he was of his daughter.“Wow! How proud am I of my daughter Stella designing this beautiful dress for Meghan on this historic day,” he wrote.“Congratulations all around. Me, Nancy and all our family send our love to all those involved.”Stella McCartney added that designing for the Duchess of Sussex was one of the most “humbling moments” of her career.“I am so proud and honoured to have been chosen by the Duchess of Sussex to make her evening gown and represent British design,” McCartney said in a statement.McCartney is an advocate for sustainable fashion and female empowerment, two causes that the new Duchess also supports.